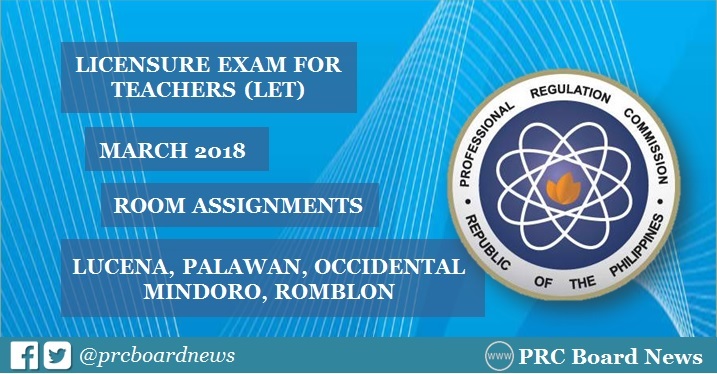 MANILA, Philippines - The Professional Regulation Commission (PRC) Lucena regional office has released list of room assignment for examinees of March 25, 2018 Licensure Exam for Teachers (LET) in Lucena City, San Jose, Occidental Mindoro, Romblon and Puerto Princesa, Palawan. The first LET this year will be administered also in Antique; Bacolod; Baguio; Cagayan de Oro; Cebu City; Davao City; General Santos; Iloilo City; Legazpi City; Manila; Rosales, Pangasinan; Tacloban; Catarman, Northern Samar; Tuguegarao City, Pagadian City and Zamboanga. For more information and other concerns: Email @ prc.lucena@gmail.com and FAQS: 042-373-7316. NOTE: PRC Board News will also update this site for the results of March 2018 LET board exam. If they can make it within that time then why not now. Jump into this link http://www.surgerypersonalstatement.net/surgical-residency-personal-statement/ and get to know about personal statement for residency on surgery side. They could really help you there for your assignment writing side. see this page which has told you abour our service on personal essay writings and all. Here in this page you will get march month stories and all sort of topics. only on this page you will find the best service on the writing of mba essay. Great website, You should keep practice and practice which makes you an ideal blogger. You can go to this website and ought to deal with the best things. Everything thought of it as, is an unprecedented article. Good post, He can correspondingly tune in over and over. You can take any sort of report for your edifying report. We have a phenomenal edifying report for you. This click for info is extremely valuable to the college understudies.